“Night Eternal” is the eighth studio album by Portuguese gothic metal band Moonspell, released on May 16, 2008 in Europe and on June 10, 2008 in North America. It was preproduced in Portugal with Waldemar Sorychta from 16 November to 30 November 2007 and it was recorded in Denmark at Antfarm studio from 7 January to 31 January 2008. Fernando Ribeiro words about "Night Eternal" Reissue: THE NIGHT IS OURS, THE NIGHT IS ETERNAL "Time sets the difference. Everything we do, everything we are belongs to time. Time owns, uses and wears us out. When I overhear an old school talk about Metal, I am always excited to hear more. Until the moment when who’s talking refers to the year 2000, 2001 as old school.Then I stop hearing, it’s a gut feeling. My transposition of time is perhaps larger and I date old school as something belonging the Seventies, Eighties or Nineties. My internal clock stops there, as far as old school goes. There will be time. Curiously enough, for me our old school material has much to do with the time before Sin/Pecado. 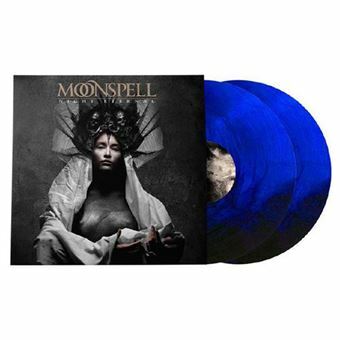 We are convinced that since that album in particular, things about Moonspell took a drastic change, at all levels. Another noteworthy “epistemological” barrier on our history as a band was when we switched from Century Media to Steamhammer/SPV. The wheels turned inside the band as we were leaving comfort zone. We had much to prove.